From what initially started out as a "what if?" has slowly been gaining momentum to be a "here now". And it's great to be here now; a point, where after eight full videos (and a bunch of slightly experimental teasers), we are buzzing to give you more videos. The Stories of Bike core team is pretty small. At two fellas (Cam Elkins: Direction, Videography, Editing - Jack Elkins: Music) we do the best we can with the limited resources we have. But we find that it's the limitations that we have, like many fine bike builders out there, that bring out the best in our creativity. Inititially, when we knew we had basic equipment to shoot and edit with, we needed to focus on our story. Get that right and, hopefully, folks might overlook certain quirks. So we searched for stories that interested us. Stories that spoke, not just about some amazing and unique bikes, but also about the multitude of reasons why we get on two wheels. Everyone has a unique and special story to tell. In 2014 we're aiming to tell even more stories and in countries beyond Australia. But for 2013 we had some very special moments. Right from posting our first video Tunnels in May to watching Brad come off his bike in Contact 3 and especially the wonderful experience we had with shooting Romance. 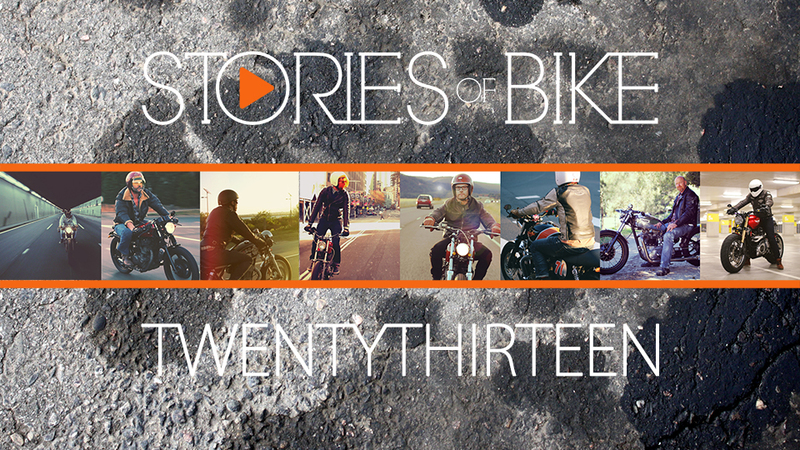 Every video we make is an intimate look into each of our featured riders' lives. But to get this far, we couldn't have done it without all of you. YOU have made this journey for us a very special one, by engaging so passionately with all of our videos and sharing them with your mates. We've loved reading all of your comments and hearing all of your feedback. It's a big part of what makes us want to keep producing these videos. We've received some touching emails and messages from fans all over the world, which are always great to read. So, thank you. Thank YOU for making Stories of Bike a great experience for us. We'll be back very soon with the release of Episodes 9 through 12 to cap of Season 1 and then some exciting news for Season 2. Until then, share your stories and ride safe. Which stories have been your standouts so far?